TheGuitarReview.com is completely free for personal use, and it would help a LOT if you could help a little bit (you can change the suggested amount in the next screen) to assist me to run the site and the occasional set of strings! 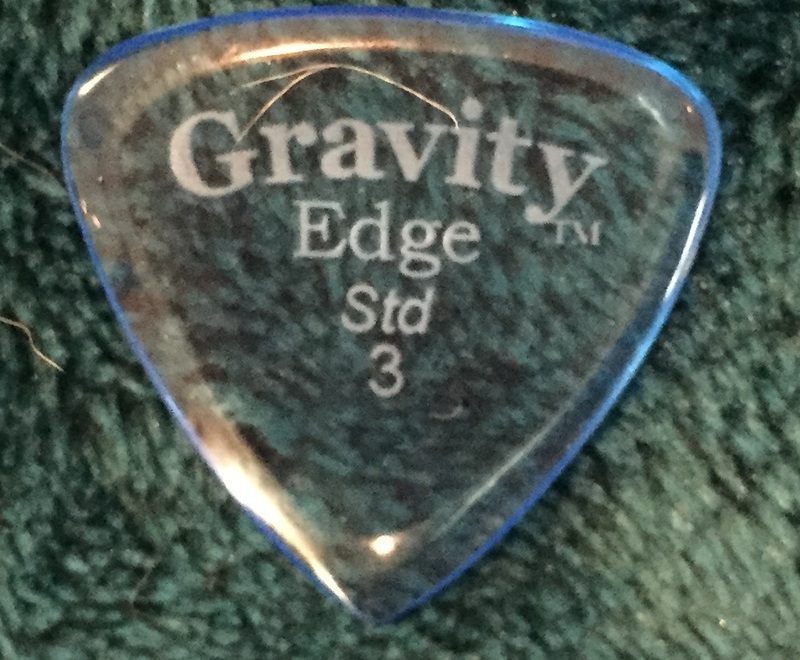 The Gravity Guitar Pick Review: Set fire to your sound and your technique! I like to change the sound of my music from one recording to another, and particularly from one album to another (I have recorded 15 albums to date now…). This often entails different instruments, different recording gear (or recording techniques), different ambient work, and different accessories. Yes, accessories… Strings, Picks, Mutes, and more. This review addresses a great find in the accessory world that makes a big difference in the sound of my recordings – while adding better playability for most of my pick-based technique. Buy some today. You’ll be very glad you did. To know why I think so, read on! The pick pictures in this review are of picks I’ve used extensively. The Classic, Razer, Edge, Sunrise, and Tripp have all seen play time in local acoustic gigs and in TWO of my most recent albums Halcyon Lullabies and the yet-to-be-released North by Northwest. To hear the direct influence of some of my favorites, listen to Halcyon Lullabies tracks Maggie’s Tone Poem (my red Razer XL), The Wandering Soul (my orange Sunrise), Evenfall three instruments with different edges of my blue Tripp XL, and Herman’s Song – a Father’s wish (a requiem for Maggie’s dad) for my blue Edge. They are durable, affordable, and really comfortable. My Biggest Reason(TM)? They sound wonderful. Since I gig with them and record with them, their consistent quality and consistent sound amongst identical picks is really great. Some premium picks are like different woods in the same guitar shape: you have to try lots of them to get the one that sounds the best. With Gravity picks, the sound is comfortably consistent and reliable. I need that when I flip on the mic pre or the DI. I haven’t met a Gravity pick I don’t like. I’m hoping to buy a Gold and some new Thins soon so I can upgrade my pick arsenal. The different edge finishes give you striking combinations of attack and release – even amongst acoustic and electric guitars. I’ve found that the smoother edge sounds nicer on acoustic, particularly with coated strings. The more course edge gives REAL bite and mix-cut-through for electrics, particularly when you’re playing with low gain or low distortion. The sound of these picks is superb. That’s the 75% of the reason why I love them so much. I can get really great warm sound with the super-thick smooth-edge picks and get nice bright attacks and releases with the thinner picks with the rougher edges. There’s a lot of variety, so there’s likely to be one with which you will fall in love! 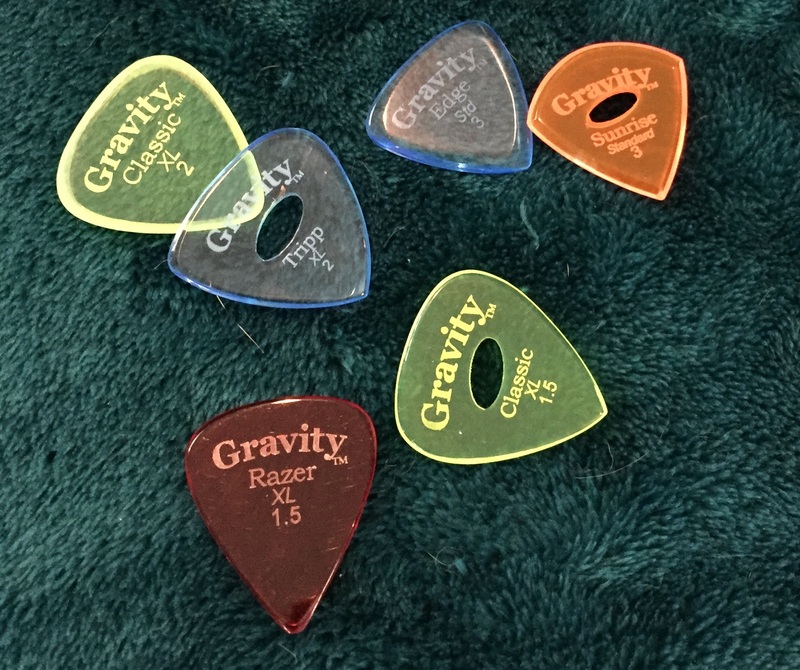 The Gravity guitar pick line comes in a dizzying array of options. I’ve not found a type of pick I play that can’t be ordered as a Gravity pick. Now with the new “Thin” line of Gravity picks, you can now get down to .60mm to at least 6mm. Almost all pick varieties, from the basic Thin pick to the lovely acrylic picks to the gold series all come in a variety of styles and sizes. I won’t enumerate them all here, but I’ll bring up a few of my favorites to give you an idea of what I’ve used and what I like about Gravity picks. Ask Chris at Gravity about pick finishing options. You’ll be glad you did! Some players love it when they find a pick with a grip option. There are several grip options with Gravity picks, including holes in the picks and engravings on the pick surfaces. I vacillate between grip holes and no grip holes. It’s a fun feast of feelings that forever fascinates facilitation of my sound experimentations. There are ellipse grip holes, single round grip hole, and “little round hole group”” grip holes. I like all of them. And the Mini. I like Mini Coopers (I drive an R59 these days): I like the Gravity Mini, Too. The Gold series comes in any color you want, as long as it is Ivory(ish). Personally, I like it. Gravity picks have been a real mainstay for me this past year. 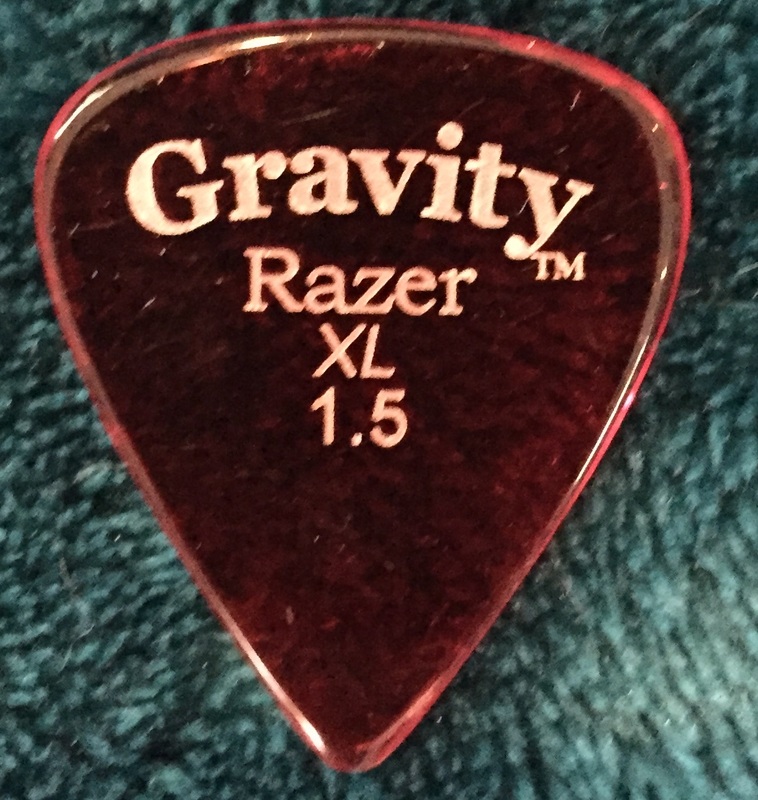 I still use some of my previous go-to picks (Dragon’s Heart Pure, Dunlops, Claytons, Fenders, and such): still, my wide assortment of Gravity picks has taken over much of my playing. Bear in mind that I am still largely a finger-style player – but great picks make for great sound! When I play with a pick, I do a hybrid finger-pick style, something close to a claw or chicken-pickin’ approach. I’m comforted with the clear and precise attack of the Gravity pick combined with the sensory input and varieties of sounds I can get in combination of pick and fingers. Gravity picks last a LONG TIME. Go to the Gravity Custom Shop page here to design your own combination!. The price of all the different echelons of Gravity picks is very reasonable. 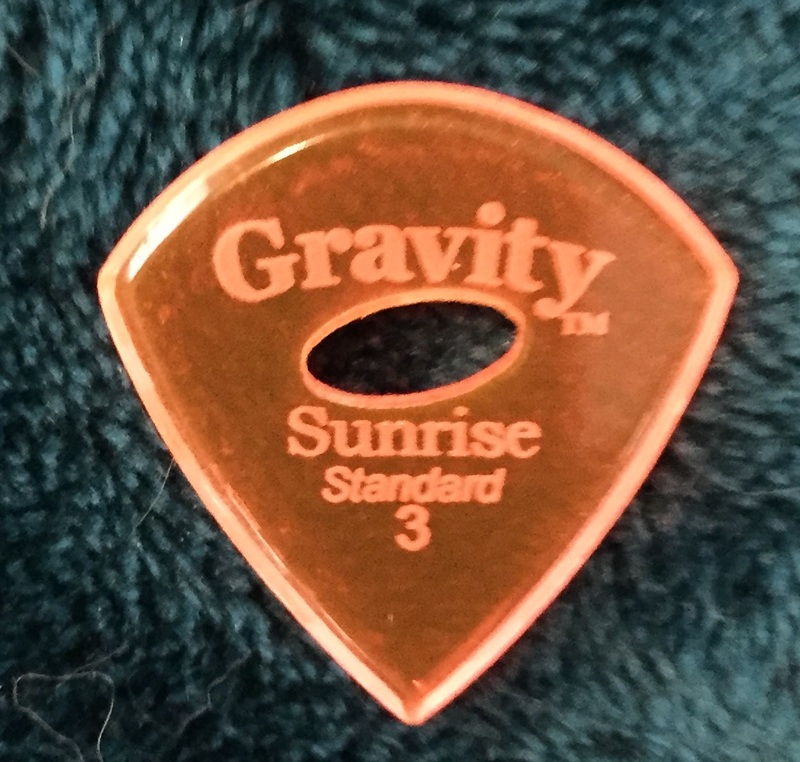 From the very inexpensive Thin Pick to the moderately-priced but very premium Gold Series – Gravity is a great choice for picks. I think of them as Premium Boutique picks at an everyday price. 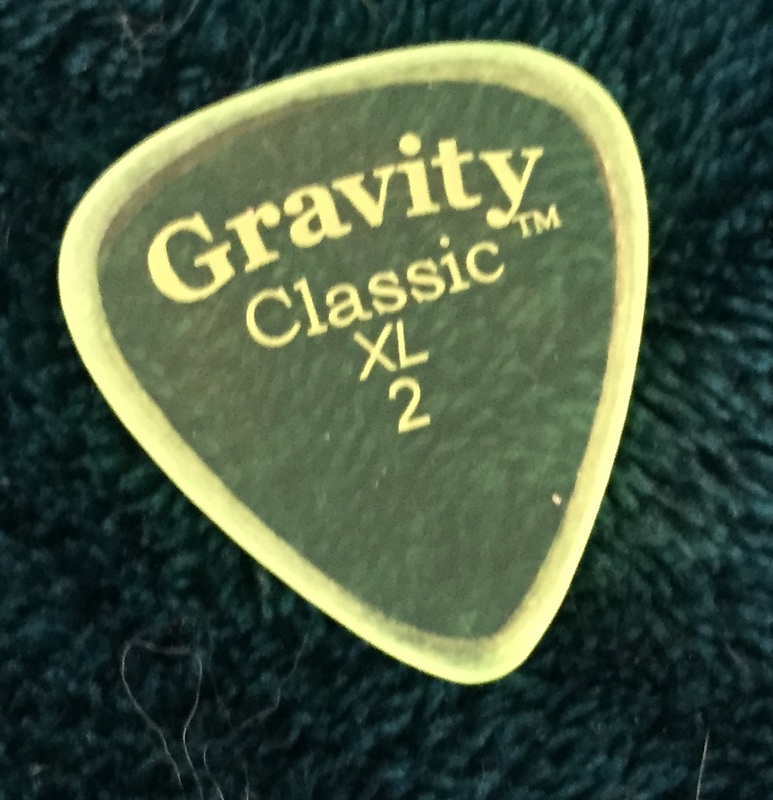 With so many players entering the Great Pick array, Gravity is in the very sweet spot of Excellent quality and playability at an Excellently low price. The variety pack at http://gravitypicks.com/products/packaged-deals?variant=1399124483 is an excellent place to start. For about $30 you can get your hands on a bunch (Eight Premium Picks!) of excellent plectrums at a very nice simple price. Buy some. Play them all. Feel the joy of a great pick that feels great too. 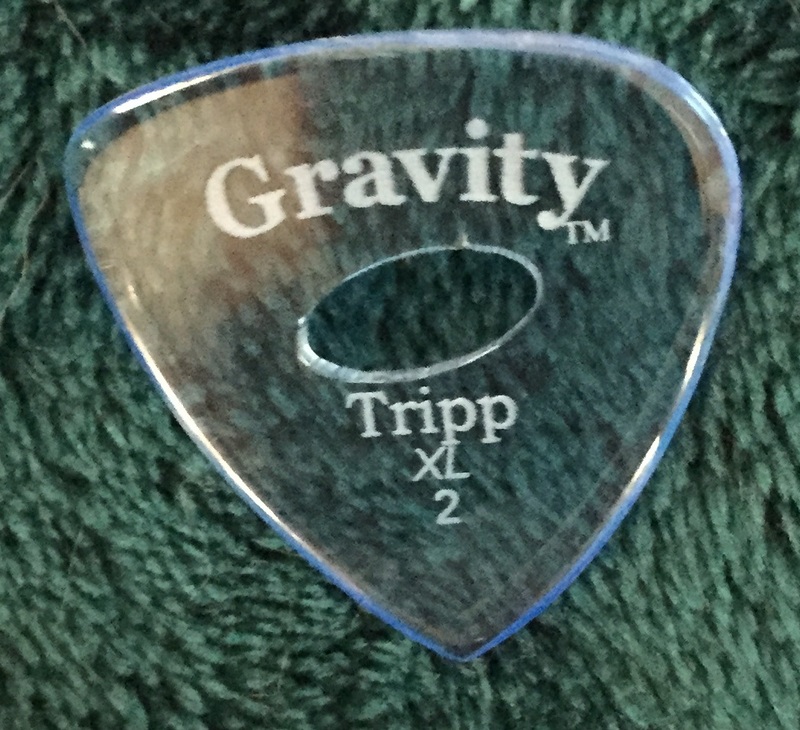 I think it would be a blast for us to be able to upload a graphic to the Gravity site and order a pick with the graphic etched on it. I am aware that there are technical and legal challenges with this approach – it would just be a lot of fun. This entry was posted in Accessories Review, Gear Review and tagged accessories, gravity, gravity picks, guitar, picks, review by Jim of Vivid Peace. Bookmark the permalink.